Each year, Dr. Tiff completes many hours of continuing education. She has extensively studied orthodontics, dental implants, and cosmetic dentistry. Dr. Tiff’s goal is to strengthen her skills and broaden the care she is able to provide her patients on a constant basis. Continuing education allows her to develop a plan for treating the entire mouth, and incorporate function and beauty, for the strongest results. By attending conferences, lectures, and seminars, Dr. Tiff stays current on treatment and technology developments. This ensures she is able to provide each patient with the highest level of care and care options available. Dr. Tiff created the I Love My Dentist foundation, through which she educates and mentors teens and young adults. The foundation’s mission is to alter the stigma of dental visits by encouraging preventive care. The foundation also encourages the youth in our community to consider dentistry as a career path. She also volunteers with Junior Achievement Gwinnett and has served as the Economic Delvopment Committee Chair for the National Coalition of 100 Black Women. Dr Tiff is a proud member of the Dogwood City (GA) Chapter of The Links Incorporated. 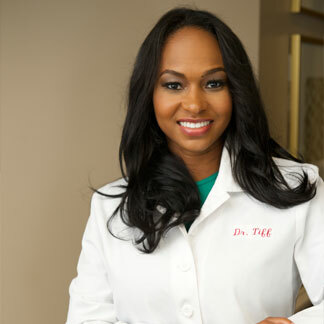 An Atlanta native, Dr. Tiff moved back to the city after honing her craft in Louisiana, Washington, DC, New York City, and Los Angeles. When she is not working or reading about dentistry and orthodontics, Dr. Tiff enjoys spending time with her husband Bryan Rand, as well as family and friends, running, yoga, and cooking.